The reviewer borrowed a copy of the book from her school library. Jason Chin's book, Redwoods, was well received by readers and reviewers when it was published in 2009. Combining elements of fantasy with facts about redwood forests was an imaginative way to share a nonfiction story. Chin's new book is created in the same style, and it's sure to delight readers. From first glance at the title page, you know it's going to be good. A girl reaches onto a shelf in a library and pulls out a book titled Coral Reefs. As the girl opens the nonfiction book and begins to read, coral mysteriously appears on the library tables. She is so engrossed in the book that she doesn't even notice the reef that is growing around her until water and marine creatures rush through the library window. Soon the girl is swimming with tropical fish. 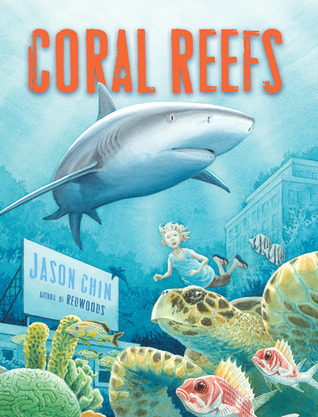 Each page transports readers deeper and deeper into the coral reef. As in Redwoods, the text is written in an expository form instead of a narrative. The story takes on a whimsical feel because of the illustrations while the text sticks to the facts. Although the picture book format will appeal to younger readers, the text is more accessible to upper elementary readers. "Many of the relationships are between predator and prey. Corals eat plankton, tiny organisms that float through the water. The polyps use their tentacles to catch the plankton so they can eat it." Chin's watercolor illustrations are amazing. Readers will want to linger on each page to appreciate the details: the fish painted on the library's ceiling, the crab sitting at the girl's feet, the sharks pictured from a distance through the library windows. The depth and richness of illustrations will make readers feel as if they are swimming in a coral reef. In an author's note in the back, Chin explains that he traveled to Belize to do research for the book. As the book concludes, even the end papers feature illustrations of coral reef creatures. 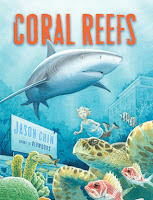 Coral Reefs is a beautiful book that will take readers on a real adventure.